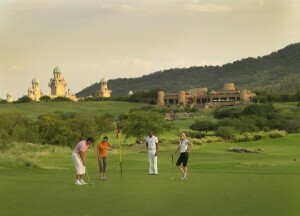 The Lost City Golf Course is an 18-hole desert-style golf course within the Sun City entertainment complex in the semi-desert of the North-West Province of South Africa. 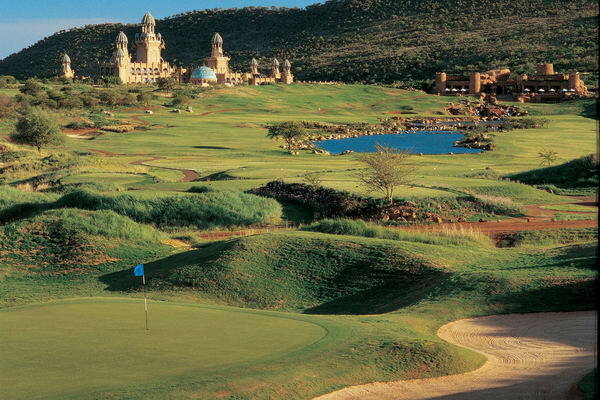 Designed by South Africa’s grand master of golf Gary Player, the Lost City Golf Course covers more than 100 hectares and incorporates 28,000 m2 of water features. It comes as no surprise that golf carts are compulsory. 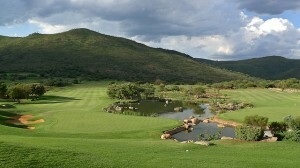 The rich green fairways give a dramatic contrast to the bushveld backdrop and the barren waste bunkers are a special feature of this intriguing course; the fairways were originally planted with the Bay view strain of Bermuda, but later replanted with the hardier kikuyu, making the fairways easier to hit. 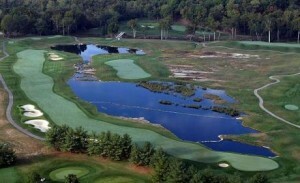 The front nine holes have a desert style layout with a classic links feel. Large waste bunkers are common to this part of the course preventing a safe landing area for drivers and placing a premium on straight hitting. Playing the back nine is like going on a golf safari. It has often been noted that the game is more exciting when played downhill and this is certainly the case here. In addition to the previously mentioned thirteenth, holes eleven, fourteen, fifteen and sixteen are all played from elevated tees offering thrill, excitement and a challenge to the golfer – as well as some of the most spectacular African views to be had on a golf course. Unique to this 72 par course are the 40 crocodiles at the 13th hole, the signature hole, making this one of the most unusual golf courses in the world; the green is shaped like the African continent and from the elevated tee you can see the nine bunkers and water hazards that guard the hole. Golfers are discouraged from retrieving their wayward balls from the crock infested pool. 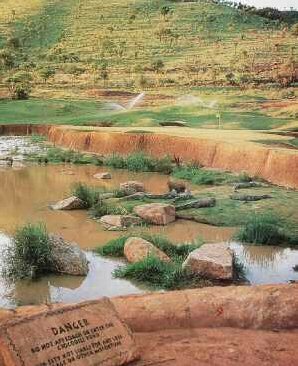 On the whole, a round of golf at The Lost City is an experience which one will not easily forget.